There were many more along these lines but this sample should be sufficient to illustrate the issue. "If prayers did anything, they'd still be alive." That is an astonishing misunderstanding of the purpose of prayer. 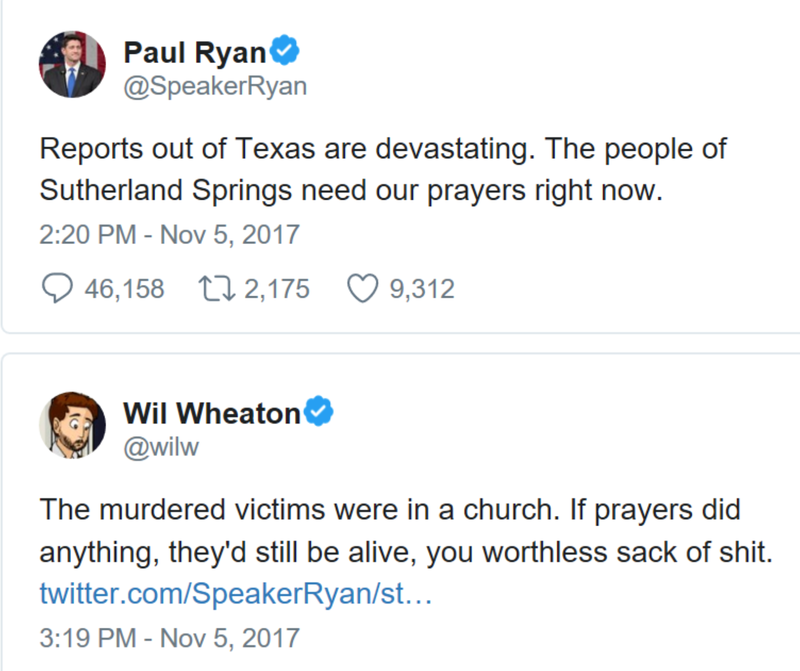 I'd like to try to assist Mr. Wheaton and others as to what my fellow Christians were doing in Church one week ago this morning. Jesus declared, “‘Love the Lord your God with all your heart and with all your soul and with all your mind.’ This is the first and greatest commandment. And the second is like it. 'Love your neighbor as yourself.' All the Law and the Prophets depend on these two commandments." 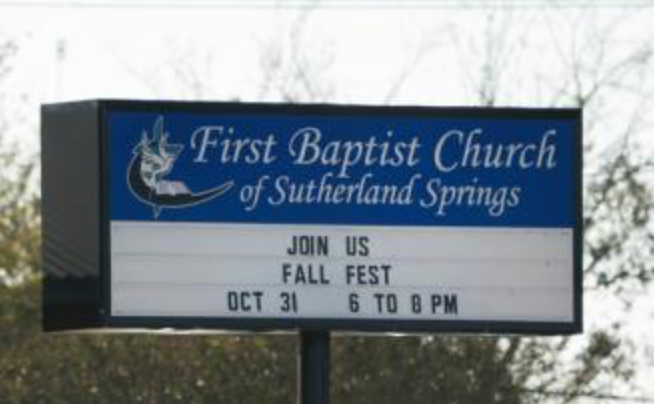 The people in the Sutherland Springs Baptist Church were also observing the third of the Ten Commandments of the Old Testament: "Remember to keep holy the Sabbath Day." Jesus told us, over and over, of the necessity of prayer. With that in mind, what was the ultimate purpose of the First Baptist's congregations' prayers and their fidelity to Jesus' commandments? To attain eternal salvation in Heaven. I believe those martyred souls are there now, enjoying a blissful existence far beyond what we on earth can begin to conceive. What about the rest of us? 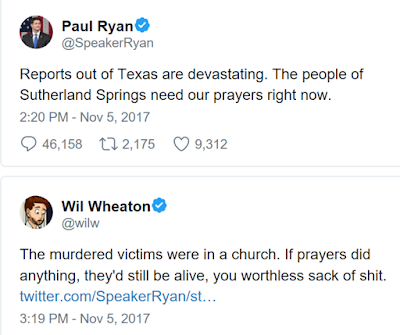 What is the point of us praying for the remaining wounded victims and the people of Sutherland Springs as Speaker Ryan suggested? Well, think about the second half Jesus' statement above, "And the second is like it. 'Love your neighbor as yourself'." Those of us outside of Sutherland Springs, as an act of love, can and should pray to the Lord to bring his healing grace to the people left behind, to the first responders who had to deal with the horror of the Church shooting, and, yes, for the troubled soul of the shooter, Devin Patrick Kelley. The last one may be surprising, but Jesus further told us, You have heard that it was said, 'You shall love your neighbor and hate your enemy.' But I say to you, love your enemies and pray for those who persecute you. If, as people of faith, we view life's most imperative goal to be the attainment of Heaven, then prayer is the very best thing we can do for each other as every one of us needs God's grace and comfort. Finally, to clear up another point of confusion that seems common among my atheist and indifferent to religion friends: when we pray for you or for anyone else, it is solely an act of love. Please understand we pray not because we think you are a 'sinner' (even though all of us are) or are deficient in some other way. We pray for you out of a sense of love and because we want nothing but the best for you. I realize this topic is far from my usual topics about weather, climate and science. With regard to the latter, as I have written on a number of occasions, I see no conflict between science and religion. I sincerely hope this posting is helpful to those who misunderstand why Christians pray as we do. I will be back with my regular topics tomorrow. Big News: "Warnings" Back in Stock at Amazon!! Mazel Tov, Mindy and Mark!! Saturday Fun: A Free Apple Fritter? Okay, Then! The New Climate Report: Keep Cool!